‘Audio to video synchronization‘ is an extremely important aspect of a multimedia file, because when playing, multimedia players rely on it for properly synchronizing the audio and the video tracks. If the synchronization value is incorrect, then the audio (or the video) is going to be played early or with a delay, compared to the other, which is commonly known as ‘lip-sync’ errors, and it jeopardizes all the excitement, obviously. For instance, while watching a movie, if you have ever come across situations like gunshot firing sounds coming out before its video scene is displayed, then that is due to an improper audio to video sync. This is a pretty common issue in multimedia files and there are many reasons behind its existence, but for keeping the article clear and simple so that anyone can understand its context without having to go through boring technical details, I will not mention them. Sometimes syncing issues are also caused by audio hardware devices (sound cards, amplifiers or even buggy headphones etc). But this method that I’m going to show you, only works if the sync problem lies with the multimedia file. If it’s hardware based, you should be looking elsewhere. In any case, the good news is, depending on the OS platform that you are using, there are powerful software multimedia players (VLC, KMPlayer, MPLayer etc) that give you the ability to manually adjust the sync (video or audio) setting, thus you can enjoy the multimedia files without such issues. The problem with that method however is that it only saves the sync setting temporarily, and it will be lost the next time you play it. Therefore, the most ideal solution is to use a video syncing (synchronization) software to fix it. And the good news is that you don’t have to buy a premium software utility, because thanks to a great (and free) open-source tool called ‘Avidemux’, you can save the audio & video out of sync setting permanently for a lots of video & audio codecs (HD, Blu-ray or even 4K videos!) and container formats (MP4, MKV, FLV, MPEG, AVI etc). ‘Avidemu’ is actually one of the best free audio and video synchronization software that you can use (it’s originally intended purpose is actually to act as a simple video editing & encoding software which comes with in-built filters etc). ‘Avidemux’ also supports multiple operating systems, therefore you don’t have to be only a Windows user to use it either. So if you’re having lip-sync errors in one of your multimedia files, then you can try the below ‘Steps’ for a possible fix. While the results are not always guaranteed, ‘Avidemux’ has a good track record. If this method fails, then I’ve added another method that guarantees results in most situations at the end of the article as well. Update (2017-07-25): Yes it’s been more than four years since I originally wrote this post (yes, even so, I update it from time to time), but the instructions still work. I just added this ‘update’ just to give some confidence to the readers. First of all, go to this page, download the package and install it (it has pre-built packages for Windows, Mac OS X and GNU/Linux). Now open ‘Avidemux’ program and load the ‘troublesome’ multimedia file into it. 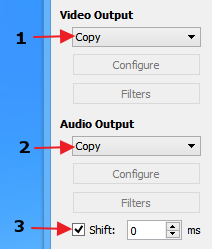 Before continuing, under the ‘Video Output‘ and ‘Audio Output‘ options, make sure it says ‘Copy’. Also make sure to enable the option called ‘Shift’ (disabled by default), as it is the option that lets you change the audio/video sync setting (shown below). Any value that you enter here (‘Shift’) should be in milliseconds (1000 milliseconds = 1 second). Now, if you know what the correct audio/video sync value is then you can skip this and go directly into the end of ‘Step 5‘. If not, click on the ‘Play’ button on ‘Avidemux’ window, so we can observe and see whether the audio comes before or after the video scenes. How to Sync Audio and Video Correctly? The rule of the thumb is that, if the audio is played before the video, then that means we have to ‘add time’ to it (thus delaying it), so the video track can ‘catch up’ with the audio track. This is done by entering a positive sync value (say 200 milliseconds) into the ‘Shift’ box. If it comes few seconds (or milliseconds) after the video scene is displayed, then it is already delayed, therefore, we have to ‘remove time’ from it, thus making it being played early. One cannot give you the exact audio/video sync value that is needed as it is something that you will have to guess by observing the video playback. However, in my experience, the usual range is 200 milliseconds to 2000 milliseconds (2 seconds). But there can be occasions where it requires one to enter higher values. Anyhow, unlike above, this time we have to add a negative value as the sync value, in order to make it load earlier (if you enter ‘-200’, then that means the audio will be loaded 200 milliseconds early). Let’s assume that the file you loaded had an audio track that was being played with a delay. Then to make it play early, we have to enter a negative value. And unless the sync was so big that you could easily tell that the audio came few seconds after the video, I recommend that you start by entering a small negative (say a ‘-100’ milliseconds) value first. 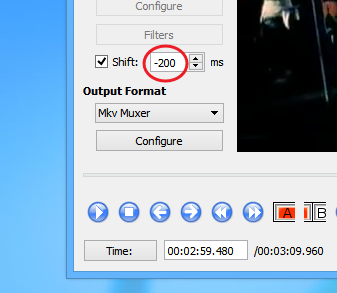 If it fixes the lip-sync a little, then add another -100 (altogether ‘-200’ milliseconds). Then carry it on until you arrive at the optimal audio/video sync value. However, before every time you apply a different sync setting, first make sure to ‘Pause’ the playback, then add the new value and resume playback. 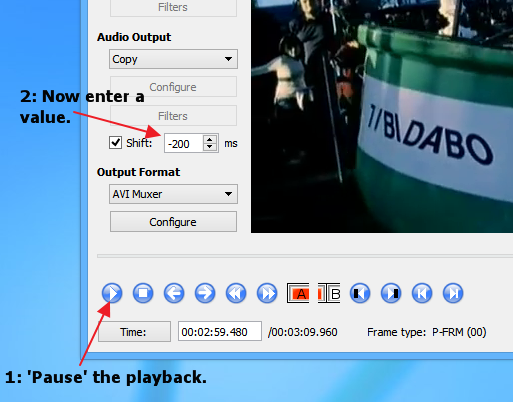 Otherwise ‘Avidemux’ will not apply that setting to the playback. Note: This is just an example (of course) and depending on your multimedia file, you will have to figure out whether to use a negative or a positive value, but the procedure is just the same. Once you are satisfied with your new audio/video sync, now all you have to do is to save the changes. But before doing so, just make sure that under the ‘Output Format’ option, you have selected the proper output format. For example, if the source file was an AVI file, then make sure to select ‘AVI Muxer’. If it was FLV, then choose ‘FLV Muxer’ etc. ‘Avidemux’ doesn’t have like a huge list there, but it supports saving into AVI, FLV, MP4, MPEG-TS, MKV etc. If your input file has a different format than listed there, then you can choose ‘MKV Muxer’ as it supports storing a huge number of different audio and video codecs. Note: Please be aware that, if you put audio/video that were previously stored in an AVI file into a MKV container, then sure MKV will store them without any issues. But most commercial hardware devices (iPad for example) will struggle to play it afterwards. This does not concern the computer users as most popular players support playing the awesome MKV format. Update: Sometimes while trying to fix a MP4 file, though you might be able to successfully fix it and play it in ‘Avidemux’, the corrected sync value might simply be lost, after saving it into a new MP4. If this occurs, then I advice you to try selecting ‘MP4v2 Muxer‘ rather than using the ‘MP4 Muxer‘ (under ‘Output Format‘). I have been able to successfully save the corrected sync settings of certain MP4 files, by simply making that change alone!. Update 2: If that doesn’t work, then try changing the audio output from ‘copy’ to ‘MP3 Lame’. Yes this will re-encode the audio file, but it shouldn’t take a long time since encoding an audio track isn’t as difficult or time consuming as encoding a video file. I haven’t tried this, but someone called ‘John’ in the comment section let me know of this which has worked for him under Windows XP. I just have a gut feeling that this might work for all those of you who doesn’t seem to get an audio track in the output file after fixing the lip sync issue. Once all is done, from its menu click on: ‘File’ -> ‘Save’ to save the changes permanently. Depending on the length of the video, the time it takes will differ, but it should not take much longer (pretty much like copying that file over to somewhere else) since nothing gets re-encoded. When it is finished saving, you can open that file using any media player, and if the sync value you entered was correct, then it should be playable without any sync issues. Well, that is it!. Update: Some readers have complained that ‘Avidemux’ software is not always working for them when correcting the audio and video synchronization. So I wrote another method that uses another software tool (it involves two tools actually), which is known to work most of the time for correctly syncing the audio and the video. However, that method only supports saving your input files (you can input almost anything into it AVI, MPEG, MP4, FLV …) into ‘MKV’, which as briefly mentioned above, is not playable on certain hardware based multimedia players. You can read about it from here. Have you tried putting the changed file into ‘MKV’, under the ‘Output Format’ option ? before load files go to preferences /automation and tick all except bitstream. then load file ,leave all settings defaults ie copy. I have avidmux 2.6.4. It doesn’t have automation under preferences or anywhere else as far as I can tell. are you using a different version? thanks a lot ant !!! 1. Typically, audio/video sync issues occur with DVB recordings. However, in that case the actual offset can vary throughout the recording whenever there is a bad packet in the MPEG transport stream. So you have to use a method that honors the timestamp embedded in the stream, like some players do (VLC does that pretty well, for instance). Avidemux unfortunately doesn’t. ProjectX does, but is very difficult to work with, and apparently fails on MPEG transport streams (at least those generated by my TV set). 2. Even assuming the offset is constant throughout the file, you can’t find the right value by trying to play the video inside Avidemux, because Avidemux’s integrated player causes about 200..300ms audio lag itself. Even with a perfectly sync’d video file, playback inside Avidemux will yield delayed audio. Therefore my method is to select a short scene, transcode it with Avidemux, and play the result in VLC to see if it’s okay. Thanks ‘Martin’, an interesting observation. I however, haven’t noticed audio delays while playing it through Avidemux’s internal player though. I have a slightly different problem, the audio start out in synch, but gets ahead of the video the farther it plays. By the end, I have a black screen and audi only for about 8 second (45 minute concert vid) Any ideas? I’m not expert on this, but I too have seen these types of videos, where the sync gets worsened the further it plays. My understanding is however, it is because of corrupted A/V stream, and I’ve never been able to successfully fix them either. That’s the only info I have. P.S: There are however, ‘Audio Synchronizers’ utilities that are built to address these issues. There are both free and paid ones that you can try (just ‘Google’ the term ‘audio synchronizer software’ for that), good luck. This is a great guide, however in AVIdemux 2.6.0 when i tried the delay with it set to “copy” i ended up with a file with no audio, so i updated to AVIdemux 2.6.4 and tried again, but this time i got no delay, file was out of sync same as original file. So i tried it with reencode of audio, to same audio format, and the delay worked then, probably with some slight degradation, but probably undetectable to most ears. This could probably be an issue with ‘AVIdemux’, however, did you put (‘copy’) the audio & video into the same container format as the original one. Because sometimes, if you put the ‘fixed’ media file into a different container format (say that you put the ‘MP4’ content to ‘AVI’, this might not be even allowed if the ‘MP4’ contains codecs that are not supported by ‘AVI’, I just wanted to give an example), there could be such issues as well. 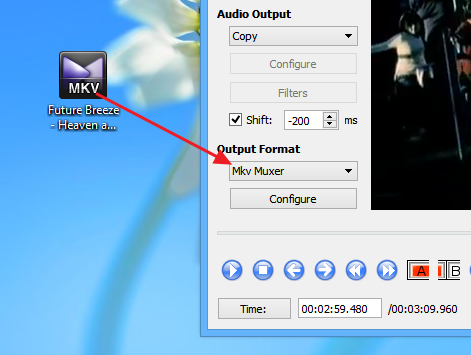 As mentioned in the article, if the original input container of the file is not present in the ‘Output Format’ option, then you can use ‘Mkv Muxer’ as it supports virtually all the major audio/video codecs. This is ridiculous how it does not work. You have it perfect but it just does not save the file you have just corrected. WHY WILL IT NOT SAVE THE CORRECTED FILE. Thanks!! Your steps worked like a charm!! The suggestion to re-encode just the audio, fixed the trouble I was having. 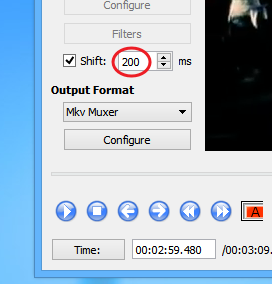 I figured out I needed 18 seconds of audio shift which is 18,000 milliseconds (the value you enter in the avidemux is milliseconds, in this case 18000), which is a lot. I had a mp4 video in a avi container. I’m using the Mac version 2.6.4 (r8694). My audio was ahead of the video by 18 seconds, which is 18000 ms (milliseconds, 1000 of which equal a second), which is the value you have to put in the shifting value box. You also have to check the box by shift window under “Audio Output” on the left hand menu. if it had been behind by the same amount the value in the shift box would be -18000 instead. Changing the shift box in the left hand menu automatically changes the same choice if you use the menus at the top of the screen. They are the same controller and should both be checked when in use and have the same value. I’d use the one on the left hand menu, since it’s right there. My video had ads that had been inserted after the 18 second delay had been introduced, so I had to chop those out before shifting the 18 seconds. After the ads were chopped out, I did the 18 second shift. The shifting showed up in avidemux after you stop the player and restart it in avidemux. The synch was perfect in avidemux. However, when I used copy for the video and audio, with of course the shift box checked and with the 18000 value, the resulting video copy did not reflect the shift I had done and the 18 second delay was in the new copy. I took the suggestion from the above comments and made a new copy. On the new copy I kept the video choice as copy but on the audio I changed copy to MP3 (Lame). Then on the menu I chose save, named it and avidemux made a new copy. Of course it took maybe a couple of minutes instead of 20 seconds to make the copy because the audio was being re-encoded. The result was a new Video with audio that matched the video. I don’t know enough to know if MP3 Lame was the best choice regarding preserving quality, but it did work and kept the file size similar. I’ve just starting editing so I’ve probably shared more details than some need, but I would have loved to have read this post several hours ago, before I had to figure out what value was supposed to be in the shift box and should it be positive or negative. Hoping I can save someone else the effort. avidemux can only open mp4 format video is it? i try to open the rmvb, it will say it cannot locate the file. No, it can open other containers, perhaps not ‘rmvb’ though. Using a Mac OS X . . .. I ripped a number of DVDs using MacX Ripper Pro and out of 100+ movies ripped, only three would not rip with ordinary settings. For those three it was necessary to use the “safe mode” option, but it left the audio out of sync. The file takes a long time to convert – 1:1 movie time. You’re welcome Tymothy, and thank you also for the input. Although I could save the corrected file, final rendering revealed the situation described in comments above. The file is properly synced at the beginning of the film, but gradually falls out of sync where by the end it’s as much as 3/4 sec. out. Thx so much for this helpful tutorial 🙂 You’re the best 🙂 🙂 🙂 !!! I was able to properly synchronize the audio with the video using your instruction, but then I was unable to save the corrected file. When you click “file”, then “save”, there doesn’t seem to be anything happening nor any is there any indication of the saving process to let you know when it is complete. Where is the “saved” file stored? When I try to play the original file which I loaded, it is not changed. It should be saved in the location that you set after clicking on the ‘Save’ button (when you click it, it opens up a ‘file-save’ message box, here give a name to the file and a location). Please remember that, as I’ve said many times above and in the article, you should carefully select the ‘Output Format’, otherwise you’ll run into playback issues later. I do know that ‘Avidemux’ is not perfect and has its issues. For instance, I corrected the sync of a MP4 file and saved it in the MP4 format and it worked perfectly well. However, I also decided to save the same file into the ‘MKV’ format/container (within the same ‘Avidemux’ session), and the file was saved into ‘MKV, but without the corrected sync!. Weird enough, I clicked on the ‘Play’ button in ‘Avidemux’, and saw that even after adding the correct sync setting, the playback was still going on with the original out-of-sync setting (though on the earlier occasion, when I saved it into MP4, it played with the correct sync). So I manually changed the value to a different one, and let it play, and then re-changed it to the correct sync and let it play again, and this time it was playing with the correct setting. Then I saved it into ‘MKV’ again, and this occasion, it saved it with the correct sync setting. What I’m trying to say is that, most users who complain it not being able to fix their issues (though there certainly are occasions where ‘Avidemux’ doesn’t work), use a bit of common sense, and double check before you save things, because this usually fixes a lot of issues. Good luck. 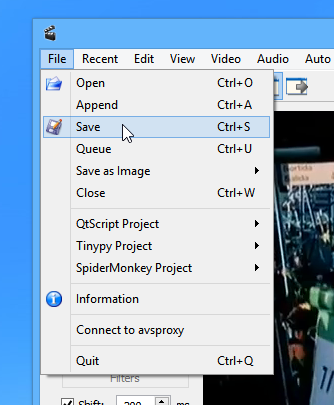 When I click “file” then “save” at the end of the process, no “file-save” message box appears as you mention above. Why is that? Also, I made sure to select the output format as MP4 (the same format as the original file) prior to saving. I’m sorry Jean, I don’t know what it doesn’t appear. Just make sure that you’re using the latest stable version of Avidemux, and especially if you’re using Windows 64-bit, then try the 32-bit version of Avidemux rather than the 64-bit. Also, try changing the output format into MKV to see if that helps. That’s the best advice I can give you. Thanks for the prompt advice. Unfortunately, I tried both the 64- and 32-bit version Avidmux and still no save message box appears. I also tried to change to output format to MKV as you suggested, but also without success. I guess I’ll have to give up and find some other audio-video sync software. It’s me again. I think I finally figured out how to do it. Apparently, you can only save the file in the “pause” mode, or at least when you click “pause” and then “save”, the “save” message box does appear and lets you name and direct the file to be saved as you stated. However, f you click “save” when the file is still playing, nothing happens. Excellent!. As I said before, a little common sense goes a long way ;-). I apologize for being such a pest but I am again having a problem with the “save” function. Suddenly after modifying and saving successfully about a dozen files, I still am able to properly sync audio and video but I am then unable to save the modified file. The “save” function seems to work normally, but then the saved file is not the modified one but the original one. Any suggestions? Thanks. I’m not sure if this helps but you can try the following. 1. Once you’ve figured out the correct sync setting/value, take a note of it (memorize it or save it into a text file for later use) and close all running instances of ‘Avidemux’). 2. Then re-open ‘Avidemux’ and load the multimedia file and re-enter the sync setting/value directly into the ‘Shift’ message box (without using the playback toolbar). 3. After that try saving the file (again, make sure to select the proper ‘muxer’) to see if it fixes it. Thank you very much for your quick feedback and suggestions. I did exactly as you suggested above but, unfortunately, this did not fix the problem and I am still unable to save the corrected file. Instead, the original uncorrected file is saved every time. This is very frustrating because, until yesterday, I had been able to successfully lip sync a number of my anime download files (all in MP4 format) but, now, I cannot continue this, even though I am not aware of doing anything different. Is there a prescribed file saving procedure (file name and/or location) which I am somehow failing to implement? I don’t understand. I even tried and re-installed the Avidemux software, but this did not correct the problem either. Any further suggestions you might have would be very welcome. Well, I mulled over some more this sudden inability to save the corrected file and I eventually decided to try one of the suggestions posted above (by Fresh Air on September 5, 2013) and set the Audio Output to “MP3(lame)” instead of “Copy”. I am glad to report that this also did the trick for me. It took considerably longer to save the file (probably because of the conversion which only proceeded at around 350 fps), but I ended up with a properly synced saved file. Hourrah! I still don’t understand what happened and why I started needing this procedural change all of a sudden, but any way that works is good enough for me. Yes, when you choose anything other than ‘Copy’, it re-encodes the track and thus it takes more time. I’m currently writing about using ‘MKVToolNix’ for fixing these issues, though this tool only gives you a MKV output which is not that widely supported by hardware based players. To what container did you put the file into ? When VLC is playing the file, press ‘Ctrl + J’ key combination. This will show you the audio & video tacks inside the multimedia file. Take a look to see if it lists the audio track. If it does, then try playing the file with another application. If all fail, then you can follow these steps for correcting the issues and this method, unlike the one described in this article, most of the time fixes lip-sync issues, though its only drawback is that it forces you to put the corrected multimedia file into the MKV container, which however shouldn’t be a problem as long as you’re planing to play it on a computer (as some hardware based multimedia players don’t support MKV). Hi gayan…it was a .mkv file and i had set the output format to mkv muxer…was that a mistake? I’m not sure what the issue is. However, try the suggested article of my above answer and that method should work without any issues since the file that you’re having issues is also a MKV file. This is only if the audio isn’t in time with the video. Do you know of a way to fix the audio is it’s slightly slower than the video? As in, at the start of the movie it’s perfectly in sync, but by the 2 hour mark, it’s out by nearly half a second. This usually happens when the audio playback rate (based on the ‘audio time codec’ setting) is imperfectly matched with the video FPS. So as you mentioned, although the track may play ‘perfectly’ in the beginning, as it progresses, the audio gets ahead or behind the video, thus leading to a bad lip-sync. For instance, if the video fps is 30 but the audio playback speed is set around to match a video that plays at 29.97 fps, then it is going to create a small lip-sync issue as the track progresses. I haven’t tried to fix this using ‘Avidemux’ (I don’t think it supports it), but if you’re familiar with ‘MKVTooNix’ (I did mention it here), and if you can calculate (within a certain degree of accuracy) how fast/slow the audio has to be played so that it matches with the video fps, then there is an option in ‘MKVToolNix’ called ‘Stretch by’ that let you control the audio playback speed, and it might be able to fix it. Figure out the by how much the audio should be delayed or played ahead, then once installed, add your multimedia file into ‘MKVToolNix’ window and select the audio track and then simply enter the value into the ‘Stretch by’ box and save your changes. If you do this correctly, it should fix the issue. You have solved a crisis for me. This works flawlessly. Thank you very much. Thanks for the tip, it worked well for me. Very good writing, thank you for taking the time to be clear. Most people don’t. I have a different problem, my mp4 videos play fine with various computer players, but then have audio sync problem when played with my Western Digital player connected to my TV. I find the problems are mostly with MP4, and not AVI. If I fast forward, they can get out of sync, and if I rewind a bit, frequently that clears up the problem. So it doesn’t seem like it is a problem in the file, but in the way the Western Digital device is playing the file. What might be going on here, and what should I do to try and fix it? First of all, you’re welcome. About the issue that you’re having: Well, since your MP4 files play just fine on other media players, it’s probably due to a bug in the software included in ‘Western Digital Player’. So other than saying ‘you should contact WD’, I have no other answer. Sorry about that. I have a similar problem, except that I have some videos that have very low volume. The video, in the format its in is sync’d perfectly. When I use AVS Video editor to increase the volume the output video comes out of sync by several hundred ms with the audio leading the video. Does avidemux provide for an increase of the volume in its output? That’s the only problem I have is trying to get the volume high enough to play properly on my TV. No, unless you’re planning on re-encoding the audio track, ‘Avidemux’ does not let changing the volume level when used just for muxing, as far as I know. Thanks, this is an extremely useful guide. And it is simple too. The pleasure is all mine Amber 🙂 . You’re welcome, and thank you also for the input 🙂 . I have a different issue file syncs and saves however after saving cannot view it? have tried 2 different formats of the same video am I doing something wrong? Thanks for clear description and for saving my time with this very fast method of solving audio delay in video file. Didn’t work. Editing Shift does nothing to my MP4. Try saving into ‘MP4v2 Muxer’ on the ‘Output Format’ rather than using the ‘MP4 Muxer’. I used avidemux and the sync worked great while still in the program. My problem I pulled in a mp4 and saved as an mp4 but it will not save as a useable file. Usually a mp4 file looks like a little film clip in my files. This looks like a piece of paper with the end folded over and list it as just (file). The same thing happens when I pull in an AVI file and save as an AVI file. Any suggestions. I used the latest version of Avidemux on Windows 8.1 and everything worked for me. It seems to me in your computer however, that the output file’s extension goes missing while saving, so (again, assuming that it is the cause) you try manually add the extension (mp4 or avi …) while saving the file by entering the extension at the end of its name field, followed by a full stop. If the corrected sync setting does not get saved when saving as mp4 (happened to me) then try saving it into ‘MP4v2 Muxer’ under ‘Output Format’. That worked. Thank you. This is so cool. I have deleted so many otherwise great bootleg concert vids because of the out of sync. Now I can fix them. I love it. I appreciate your time to help. It works good until I save it and then it reverts back to non-sync. Do I have to let the video play full length or can I stop it when I have the correct sync and save it. I have tried it both ways and it does not work. Still out of sync. Also unless I save it as the original name, it will not save at all. Non of the formats will work except for the “dummy”. Have you tried saving it into mp4 version 2 ? The pleasure is all mine Jerrard 🙂 . Norton Safe Web has analyzed open-any-file.com for safety and security problems. Below is a sample of the threats that were found. Needless to say, this is a little intimidating. Do you have another download site? Easy to follow. Quick fix. Much appreciated. Try mkvtoolnix mmg, it always works for me. I still use Avidemux for other things, but mmg be better to fix OOS. Some of your readers have problems with un-sync getting worse as the video plays: this can be corrected very easily within YAAI (Yet Another AVI Info), one would simply have to modify the fps (frames per second) rate, usually very slightly, to get a nice lip-sync all over the video. Just to get an idea: I had a 49 minute video having the ” stretch ” problem (audio ok at start but getting delayed while playing), as if the video was playing to fast. After correction and saving (very fast, no re-encoding) in YAAI, the playing time had increased from 49’10” to 49’57” ! No need to say with that time shift the original video was almost un-viewable. At FPS level, the correction was from 23.976 (original value which correspond to the 24 images per second in the movies world) down to 23,602. This slowed a bit the video, thu sshowing a perfect lips-sync all over the play-back. Thank you Bernie 🙂 . The following works for me: check to see if there are multiple tracks, either by looking beside Audio Input, e.g. “Audio Input (2 track(s))”, or by going to Audio>Select Tracks. Older versions don’t list the number of tracks beside “Audio Input”, which you can see in the example pics above. If there are multiple tracks go to Audio>Select Track; Click “Filters” for both tracks, and make sure they BOTH are shifted, and to the same value, and then try saving with MP4v2 as the output format . The audio sync issue doesn’t affect files with only one track, at least for me anyway. It seems to be a bug in thee GUI. I’d like to convert the Audio in an MKV video to AAC and save in an MP4 container so i can play on an IPad, but there is no ‘MP4’ option in the Output Format dropdown box in version 2.6.8 for windows (32bit). MP4 MUXER is the closest i see and that reports: “Unsupported. Only MP4 Video and H264 Supported for Video”, followed by “MUXER cannot open” What settings should i use please? Thanks! It worked great for me. How do you syn/video with Avidemux if the video file has different syn all through the video file? I’m not exactly sure what you meant. But if the issue that you’re having is that the sync seems to get worsened through the playback, then there is a possible fix. I did give an answer concerning that, just look for a question by ‘Tim Jong-Il’ in the comments (you can search for that term within this page by using the web-browser, ‘Ctrl’ + ‘f’ usually brings that feature up, on most browsers) and read my answer. Although this blog post did not provide me a full solution, the quality of questions and answers teached me all I needed to solve my unexpected lip-sync issue. Thank all of you. And, particularly Gayan who provides a great long time follow-up. That’s why I’m happy to share my resulting findings here. avoid conversion (just copy audio and video streams) to optimize processing time (not file size) with no loss of quality. Dumped directly to a file, the stream results in a TS container file, readable by neither VLC, Avidemux nor my television set. Mplayer plays it perfectly, without lip-sink delay. This is good news. The stream does contain information for a player to play the streams in sync. In order to avoid a time consuming file to file conversion to make the file Avidemux compatible, I convert the stream to PS, on the fly at grabbing time. ffmpeg does that without significantly loading the CPU. The resulting stream is a DVD MPEG-2 stream in a PS container file. The file is readable by VLC and Mplayer without audio delay. Unfortunately, played or exported by avidemux 2.5.6, the program stream does suffer the lip-sync issue. Maybe later versions of Avidemux fix this silently with no delay. I did not try to solve it that way, preferring sticking to my favorite distribution’s current version. There was a pretty trial and error method described above for estimating the correction shift to apply. I discovered that the appropriate time shift amount is, in my specific case, provided by mediainfo . Applying the delay reported by mediainfo fixes the lip-sync issue for my programs, not only at the beginning, but for the whole duration. The only con of this method is that it is a two phases process. That’s why I automated it. My bash script launches Avidemux, opens the file and presets shift delay and output container type. For those who like scripts, it follows. I use it as “Open with…” application in Caja (Linux Mint Debian Edition). hey, mine doesn’t really work? the input video is AVI, and I already found the shift value, which is -1350ms and I’ve tried it on the player, it matched (I’ve also tried it manually on Daum Pot Player). When I save the file, it always come out out of sync, though the audio is a little faster than the original file, but out of sync nevertheless, even though it was perfect on the playback. I’ve tried MKV, MP4, MP4V2 outputs but none work. Ah, I’ve done it with the MKVToolNix. It works wonders after the frustrating Avidemux. Thank you so much for the simple guide!!! You’re welcome Rhea. ‘MKVToolNix’ is the best approach to solve this problem. Hi, thanks so much this worked!! i am forever in your debt!! At first it worked fine for a couple of videos but when I got a third synced correctly and tried to save using Muxer MP4, I got the following error messages: (1) Unsupported Only MP4 Video & H264 supported for video. (2) Muxer Cannot Open (3) Failed [my MP4 file] was NOT saved correctly. What is wrong? As included in the error, perhaps your multimedia file contains unsupported media audio/video streams. Have you tried ‘MP4v2Muxer’ under ‘Output Format’ option? If all fail, then try using the ‘Mkv Muxer’, though it has its drawback since the playback of ‘mkv’ files are not widely supported by most hardware based multimedia players, as mentioned earlier. Can anyone explain why and how to cure the fact that Avidemux when playing an mp4 video (other file types not tried) I have a 5 second audio delay when played on one computer but but not when played on another computer? I have installed the same release of Avidemux. Unfortunately, the PC I have intended to use for storing, playing and editing videos is the PC that has this audio delay problem. Usually, when cutting parts out of an mp4 file, I get the message about the cuts not being at the start of an Iframe but that does not matter. I was going to look into that once I have this other peculiarity within the the Avidemux installation/setup resolved. Has anyone else had this problem with Avidemux? Synchronization of the video and audio is not always perfectly, especially if you shoot at a distance and have very poor reference sound. I do sync for about 5 years 🙂 and always facing with a lot of problem. But recently I came across one video where video transferring in real time between two smartphones and everything sync automatically, so no need to spent time on syncing, it called Microphone Rocks 🙂 Check it here: http://www.microphone.rocks I think it will change the way we shoot videos and combining it with audio with smart devices. Thank you Anna for the news. Hey, man, thanks a lot for this! It really help a lot! I’ve got lots of videos that is out of sync way back. But now, they’re all fixed, and thanks to you! God bless! The pleasure is all mine Gustav 🙂 . You’re welcome CJ 🙂 . Brilliant! Thanks so much for posting this. What an invaluable tool — and your instructions couldn’t have been clearer or more concise. Truly appreciated. You’re welcome Jake 😀 . I’m sorry Rajen, it doesn’t seem to support Windows XP anymore. You can have a look at some of the older versions from the below link, but I’m not sure what version used to support Windows XP. Good luck. This software worked WONDERFULLY to sync my audio and video from MP4 to MP4v2. I am SO HAPPY! Thanks. This worked really well for me with some files I had made .mp4 using winxdvd. Very clear explanation and correcting each video was quick. (abt 30 s). this is the most comprehensive discussion on out of synch video that I’ve found. We recently discovered a solution for importing MTS files without losing sync. It is akin to Anna Hunter’s post about http://www.microphone.rocks , concering transfering video between IOS devices. After using Aimersoft to convert the MTS files and experiencing the gradual loss of synch my tech partner tried importing the MTS into iPhoto , which happens automatically when conecting an IOS device, but we are coming from a Canon AVCHD cam. The import is fast , with no loss of sync , and produces a MP4 file which easily imports into iMovie. I use iMovie6 with the GeeThree plug in for multi-cam, which unfortunaltely does not offer the sync fixing feature. I now feel I’m finding the tools after reading your posts and all the replies. thanks so much. Thank you Paul and you’re welcome too 🙂 . Great tutorial and high quality comments! My problem is similar: I import a DVD-decrypter VOB file and convert it to .avi. Conversion is excellent but voice-lip-syncing is way off…always, so the .avi is not usable. 1.) Does the lip sync gets worsened as the playback progress or is it a constant delay? Do you get small errors while copying the DVD? (maybe the audio is slightly damaged? If it’s the case, some encoders might struggle at properly setting the audio sync)). 2.) If it’s a constant delay, then have you tried to fix it with Avidemux? 3.) If it gets worsened as the playback progress, then it might be because the audio playback rate is not compatible with the video playback rate. In that case, you can try to fix it using ‘MKVToolnix’, but unfortunately, it’ll put the file into the MKV container which is not supported by, well I guess older DVD players. I’ve already laid out some of the instructions for fixing such an issue in a comment, to find it, just search for ‘apple’ in this page and you should arrive at my comment. 4.) If none of the above fix your issue, then try to copy the DVD files into the MKV container (without encoding) using ‘makemkv’ (www.makemkv.com) utility and then encode it into AVI using your application to see if it fixes it. P.S: Happy new year to you also 🙂 . I just downloaded the program onto my iMac and tried to fix an out-of-sync video, but I’m not getting any sound. Also, the little slider knob on the far left just keeps wiggling in the far left position and won’t slide to the right when I play the video. Please help. Almost a 2-hour video was out of sync from the start. When I install Avidemux on my W10 desktop, some menus and texts doesn’t appear. I tried reinstalling, installing the 32 bit version, launching the program in compatibility mode and nothing worked. Unfortunately I don’t have Windows 10 to test it out, and the only version of Windows I have is 8.1 which I run in a Virtuar-Machine under ‘Linux’. So I did the best I could and installed Avidemux in Windows 8.1 but came across no such issues. 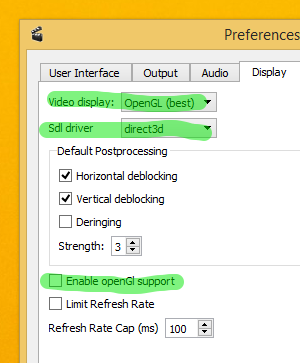 However, there is an option to enable OpenGL (to skip all the technical details, OpenGL is a tool that’s used to render the user interface of Avidemux), and while Avidemux came with it disabled in Windows 8.1 (I don’t know how it’s under Windows 10), the moment I enabled it (Edit –> Preferences –> Display: “Enable OpenGL Support”), Avidemux started crash whenever I added a video. *. Before making any changes, take a note of the default values (or if you forgot them, you can simply uninstall and re-install Avidemux). 1. So, first make sure it’s disabled on Avidemux. 2. If that doesn’t work out for you, then try changing ‘Sdl driver’ (Edit –> Preferences –> Display) to say ‘direct3d’ (whenever you make a change in Avidemux, once after applying, exit it and re-open it). 3. If that doesn’t fix it for you then you can also try changing the settings under ‘Video Display’, which is displayed just above the ‘Sdl driver’. Please let me know what happened. Again, please remember that I’m simply guessing here and what I’ve told you could or could not work. Good luck. Thank you John. That I think actually is a great tip! (I’ll update the article with it). Please, a situation where the audio output starts coming out before the video at the middle of the movie and not the beginning, how can i solve this issue.. the video was normal from the start and along the middle area of the movie, the audio started coming before the video.. How can i solve this issue without affecting the starting of the video? That’s the only thing I don’t know how to fix without re-encoding. These issues are usually caused by damaged headers or the index I presume. Sorry about that Ken. Ken, perhaps you could use an MP4 splitter to isolate the part(s) of the file where there is a problem – then join it back up? Not the neatest solution but it may work. Overall, this is a fantastic program and a really helpful article. Thanks Gayan. You’re welcome Simon. By the way, that’s one hell of a suggestion, it might actually work! 😀 . Thanks for sharing. This program looks great. Also, I know that VLC and Windows Movie Maker can do this job too. I used to read a guide about syncing audio and video form this post (http://showmore.com/sync-audio-and-video.html) The methods suggested in this post are also effective. Here is what I did to fix a movie that started off in sync but drifted out of sync toward the end of the movie. 1. Get frame rate for video track (frames per second). 2. Get the total frame count for the video track. 3. Divide the total frame count by the frame rate to get the duration of the video in seconds. 4. Get the exact duration of the audio track and convert to seconds. You may need to extract the audio track from the video to calculate the exact duration. I did this with mkvtoolnix. 5. Divide the video duration by the audio duration to get a “stretch” factor. A stretch factor that is greater than one will increase the duration of a track. A stretch factor less than one will decrease the duration of a track. 6. Now you will need software to adjust the duration of one of the tracks to match the other. In my case the audio track duration was shorter than the video. I used mkvtoolnix, selected the audio track, inserted the stretch factor into the stretch by field (which was greater than one), clicked Start muxing. In a few seconds, the software was done, the track durations matched, and the audio and video were in sync. 7. Note: work on a copy of the file just in case you need a do over. 8. Note: if the audio is too early, you need to increase the duration of the audio track to match the video OR reduce the duration of the video track to match the audio track . If the audio is too late, you need to reduce the duration of the audio track to match the video OR increase the duration of the video to match the audio track. The stretch factor is the amount that you adjust one of the tracks to match the duration of another. The goal is to make both the audio and the video tracks of equal duration. This might also be useful for subtitles that are out of sync. Great answer! I think I game a very similar one (either on this post on on the other – MKVToolnix, that I mentioned at the end of this post) as well. You have NO idea how much this helped me. I was so frustrated because I recorded an amazing gameplay and for some reason Bandicam recorded the video with unsynchronized audio. I kept looking for videos and articles but they were all about synchronising audio over already existing audio. I’m so glad I found this because it just helped me so much. Thank you for this!! The pleasure is all mine 🙂 . The two mp4 files have data but neither can open in quicktime. Also have tried two repair utilities and they cannot open it either…remo repair and stellerphoenix repair. Have you tried using MkvToolNix? It’s a very powerful utility that lets you open huge number of multimedia containers and extract (either subtitle, audio, video) the content into a MKV file without encoding. Remember though that the output file will be a MKV one. My original file was a .WMV file so I could not save it successfully (it ended up being very garbled) using Avidemux. So I used another software – NCH videopad editor – to convert it into a .AVI file and then opened that in Avidemux. It finally worked! What a relief, thank you so much! This only shifts audio and video. For those with a recording that has dropped frames due to recording from a degrading source, this does absolutely nothing. I have a video, recorded from VHS that has so many distorted frames that the capture device dropped, that the video ends at 49:12, and the audio ends 5:50 later, at 55:02. Both audio and video start synced at 00:00. This is the TRUE monster of a sync problem that has plagued me for years. Is there a solution for this type of sync problem? Something that will allow me to scale the length of a video to bring it back up to the play length of it’s audio. I don’t even mind if each moment is slightly out of sync, as long as I don’t have segments of video that play MINUTES before the corresponding audio! Yes there is a possible solution and it has already been answered by me and a few others as well. What you need to do is to manually ‘stretch’ the audio so that it plays in the proper speed in relative to the video frame rate. Just look for my answer to ‘Tim Jong-Il’ (just search for his name within the article). If the file you are playing is in mkv container there is an easier fix than this. Open header editor in MkvToolNix Gui. and make necessary changes in it. This you can do in under 1 minute and the changes are permanent. You could do this to mp4 containers too. by following the same method and making necessary changes in the header as the file is being ripped to an mkv container. This was awesome! Thank you:) Lots of comments but for anyone coming across this one… this is what I did on Linux. I choose to reencode instead of playing with audio synching (Shift). 10 minutes later (on old duo-core laptop), I got a new AVI file with video/audio working perfectly. This is the best Sync Program out there. and your simple, straight forward instructions are the best…thanks heaps! I fixed audio sync issue in my MP4 video file in seconds. It’s like magic. Other software’s actually takes hours to do such a task. Thank you Gayan, you are a live saver. I have a file that needs sync adjustment twice in the middle. i.e. I figured it out. In case anyone has the same kind of problem, you need to cut out the part that is out of sync and save it as a new file before you sync the audio, Avidemux cannot treat it in isolation on it’s own. Select the time where the problem occurs. I recommend cutting at nearest keyframes (Go to previous/next keyframe – at the bottom left bar) to avoid corruption at cutting points. Use Ctrl + PgUp to set Marker A, and Ctrl + PgDn to set Marker B. Then click DEL to delete the time in between Marker A and B. Use that method to cut out and save the clips into new files as part 1, part 2, part 3, etc. Select Mkv Muxer as Output format before saving. (It’s apparently the best option when dealing with H.265/H.264, and you can convert the finished video back to mp4, or something else with Apowersoft Free Online Video Converter). Now shift the audio of “part 2” (In my case) as many milliseconds as you need to sync it, and save it. When you’re done with all the syncing, open part 1, and once it’s up click File – Append, and select Part 2, then File – Append, and select Part 3. And there you have it. Your clips are merged. Done. Forgot to mention that you should leave Video Output and Audio Output as “Copy” the entire time. Can’t begin. Opened MP4 – got error message about no demux. It would be good to understand the problem with Avidemux instead of going to another tool that forces a file type change. No wonder this article appears high up in Google searches- it worked, even after I raised a cynical eyebrow that it might not worked properly several years after its first publication. Thank you very much for such a clearly written guide! I had a great movie but the audio sync was way off…about +10.85 sec! I followed your suggestion and it worked perfectly. Hmm that’s strange. Avidemux supports playing lots of audio/video and container formats (http://www.avidemux.org/admWiki/doku.php?id=general:input_formats). Is the audio playable on other players (say on VLC for instance)? Thanks very much for the clear instructions! Worked perfectly for me. Just echoing the last poster – great instructions, did the job. Thanks. Thank you for this guide, works great. I successfully synchronized the audio. Saved my life lol Thank You!!! Thank you Ozon 🙂 . Thanks for this great tip with avidemux. Somehow, a band video taken with a Samsung phone got the audio and video out of sync by about 1/2 sec. Avidemux worked as you described. I had to use the MP4v2 muxer to get it to work. Thanks very much for posting this! The pleasure is all mine Vince 🙂 . After quite a few hours over several days running down a bunch of blind alleys, I found this post and I was finally able to fix my audio sync issue. Thanks so much for turning me on to Avidemux! I documented your fix on my own little blog that I use to record solutions that I don’t want to forget. I linked back to this post twice in my own article (on techstrations.blogspot.com), just in case anyone gets to mine before yours. Thanks again! I don’t think there exists such software utilities as far as I know. Maybe we might see such tool in the future with the development of machine learning, but as of now, as far as I know, there are no such tools. OMG thank you so much. All I needed was to make my video audio sync with my gameplay I recorded. All I found on the internet/YouTube was that HandBrake that doesn’t seem to help. After spending like 3 hours to find solution for it, this actually does the job! My audio is 85 min. The movie I want to put it is 90 min. How can I resync the mp3 from 85 to 90 mins? In SubtitleEdit is in cases like this the Synchronisation/Change Framerate And there: From FrameRate 23 to Frame rate 25 and that is all with subs! But how is it at the audio? Never actually felt compelled to leave a feedback to any post like this. Thank you soo much. Lol. Will say…. YOU ARE THE MAN!!!!!!! What if the start of the A/V is out of sync but it’s syncing well towards the end of the file? If I were to use this technique, it will unsync the parts that our syncing well. What do you do if you have my issue? When i play the file, i can see the video but cannot hear the audio. Is there a setting i need to access to set it right. I am using an iMac with OS 10.9.5. Is there a problem with this platform ? Looking forward to any assistance to sort out the problem. Not that I know of, perhaps the file that loaded contains an audio track that is not compatible with Avidemux. There is a situation AviDemux does not address. Nonlinear audio pairing with a video. Extract a variable bit rate audio and pair the audio with a video file and the sync will be lost. Example, Tke a film such as “Night of the Living Dead”, public domain. Take the same film, dubbed in Russian, in a better resolution and extract the video. Take a lower resolution version and extract the audio. If the audio has a constant bit rate, the pair will match. If the audio has a variable bit rate, AviDemux will not be able to match and the audio in the completed video will be nonlinearly synced to the video segment. There may be a way, but I haven’t discovered the method yet. Your steps work correctly when running the video in Avidemux, but they don’t save. In order to get it to save, you have to switch Audio from Copy to some encoding (e.g. AAC (FDK)). Then it will save correctly. Worked for me saving the MP4 as MP4v2. Thank you! Mine saved perfectly as described in the article, it was an MP4 file, saved it as an MP4muxer and everything plays perfectly. Super simple!! Thank you SO much for this! The pleasure is all my Ely 🙂 . Thank you so much, it’s really worked. Easy and simple to sync my mkv file. (Tips: REMEMBER 1 second = 1000 ms). This worked for me. Thank you so much! Just wanted to add a “me too”. I had somehow completely spaced the “Shift” option in AVIDemux, and that did the trick perfectly. Nothing worse than a concert video which looks badly-dubbed: problem solved! You rock! Trying to fix out of sync audio with VLC player was a nightmare and I simply gave up on it. Your tutorial was clear and concise. Had all three videos fixed in 5 minutes. Thank you again!